The sun was shrouded in powder clouds and a Green Blob emerged from the snow gum forest. Gang-gangs hooted and hollered as The Blob moved through the white woods into a field of powdered moguls. A group of Rainbow Gorillaz looked up from their morning meal of grevillea flowers and rock moss. They had never seen such green blob. 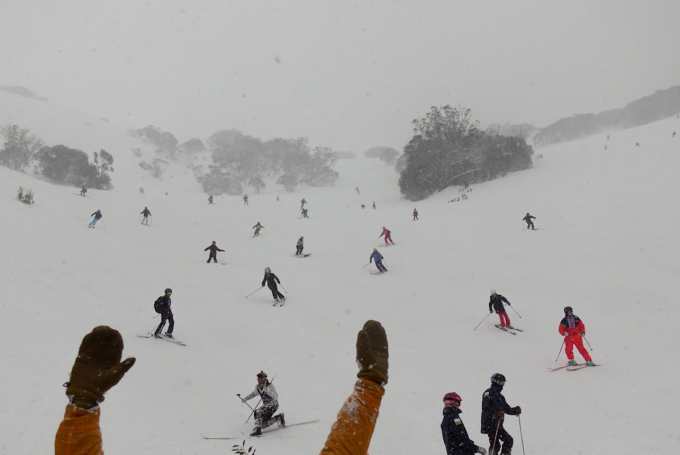 The Blob began to ski towards them. 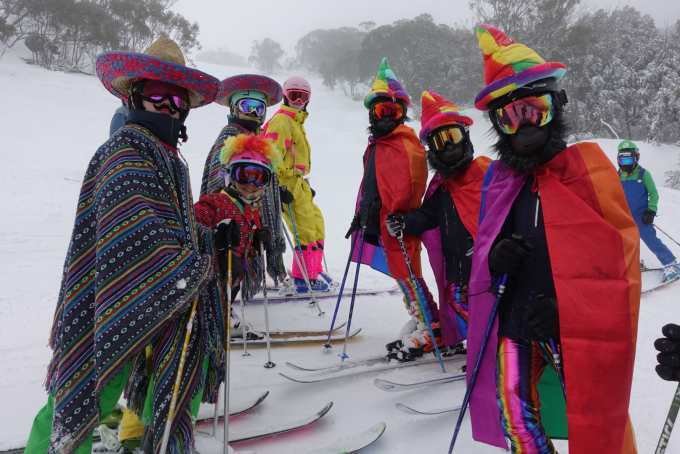 The Gorillaz quickly grabbed their skis and fled for their lives. They found cover between the moguls. The Green Blob was unable to navigate the deep snowy ditches. The Green Blob had to figure out a different strategy. She called for help, a lot of help. 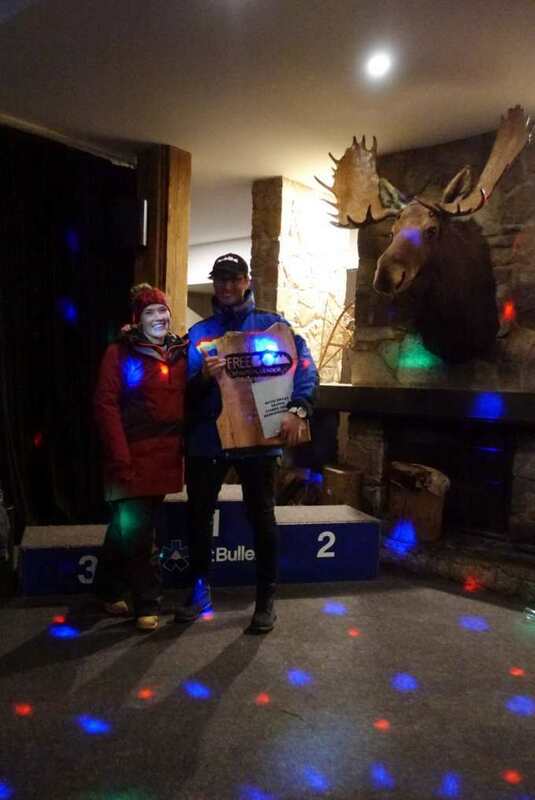 She called upon the Mt Buller Passionate Ski Community (MBPSC). The Rainbow Gorillaz mixing with some of the MBPSC after their shared run. The MBPSC arrived in waves. 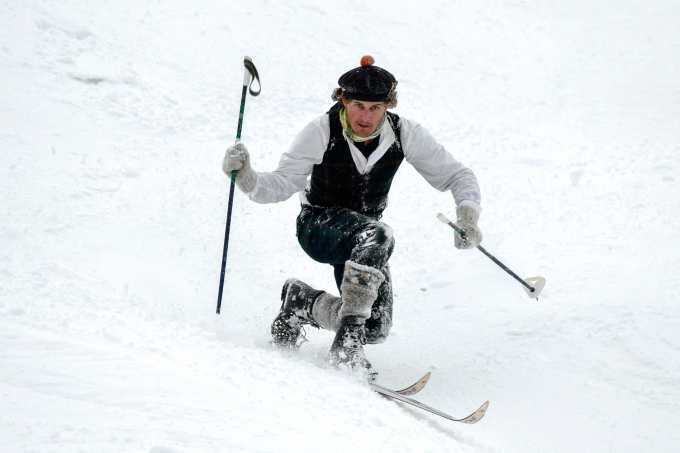 First there were five skiers all dressed in tweed. Then came a squad wearing fluorescent colours. The Green Blob got excited. She knew that Rainbow Gorillaz are frightened by bright colours. Back in their native habitat, birds feathered in pink and orange attack their young. Here in the mogul field, they were not sure what to make of these skiers. The Gorillaz huddled closer. A final wave MBPSC came flying down the mountain. They carried coffee and seemed aroused by a potent mix of caffeine and adrenaline. 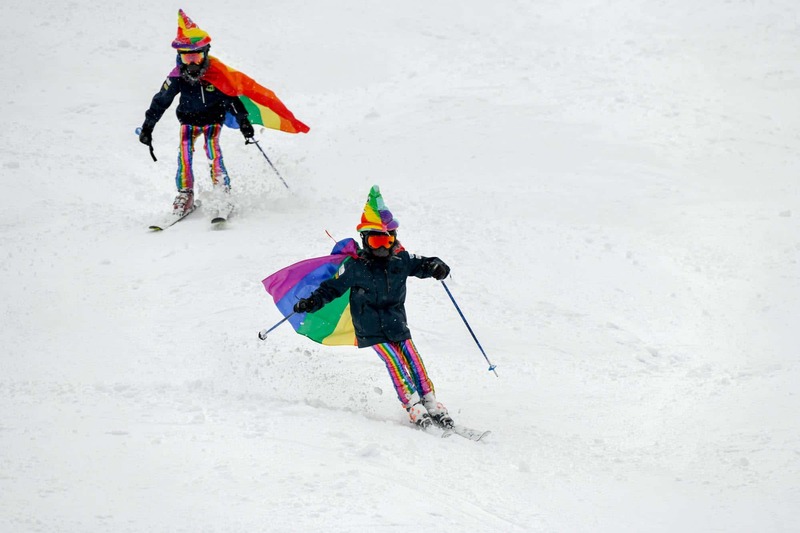 Their skis barely spent time on the snow. 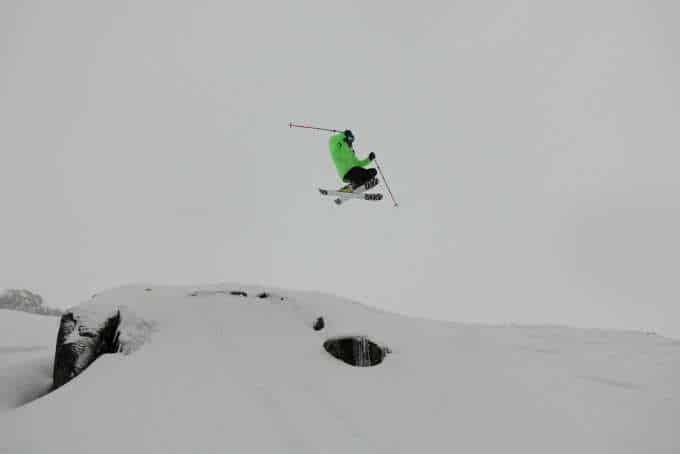 They back-flipped off rocks and bounced fearlessly from mogul to mogul. A sound drifted up the mogul field. It got louder. It became rhythmic. 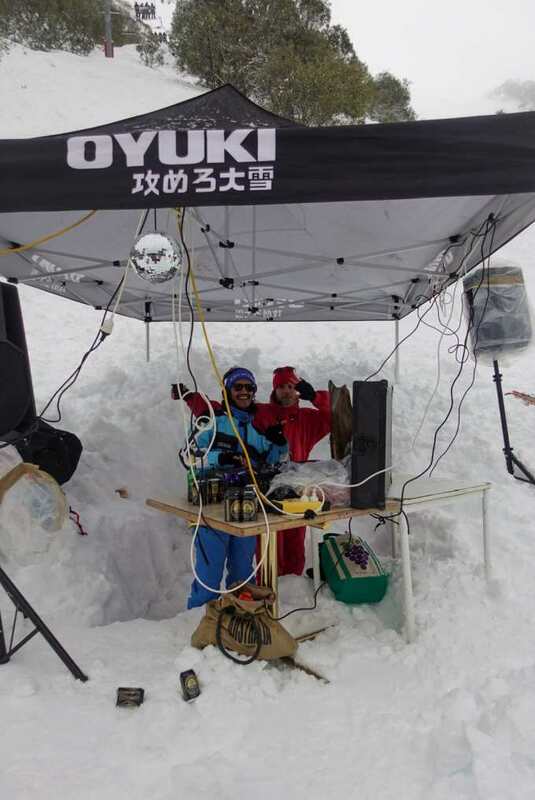 The skiers had brought a stereo with them. The Green Blob felt a rush of confidence as she witnessed the enormous backflips above her and the sound of such fun music. 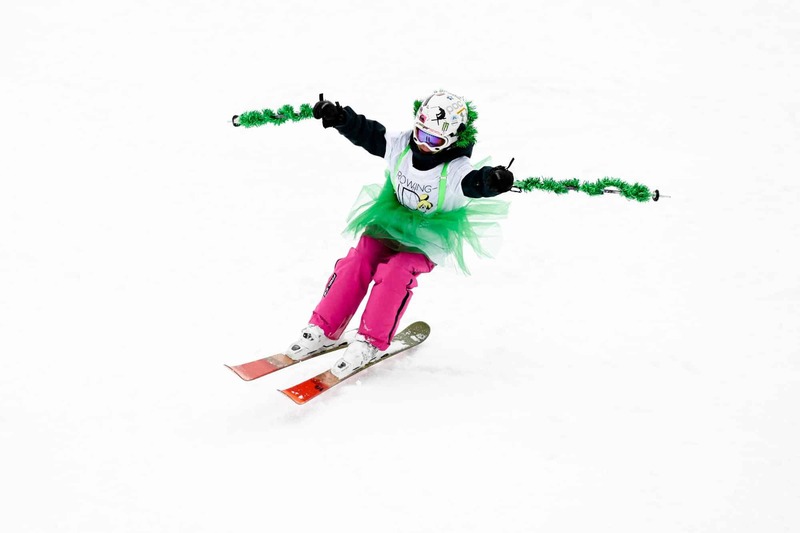 She tapped her poles, stomped her skis and entered the mogul field. She traced the line of the Rainbow Gorillaz. They saw her coming and began to ski away. 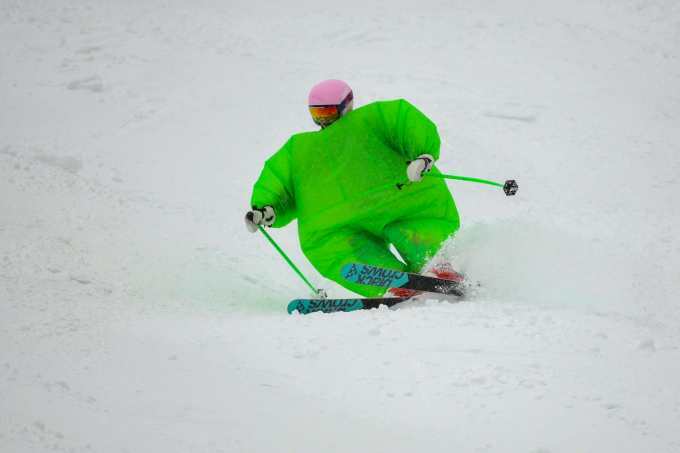 The Green Blob had never skied such beautiful moguls. She wasn’t sure if it was the moguls or the crowd of MBPSC behind her, but she wondered why she had ever feared moguls in the first place. The Green Blob, the Rainbow Gorillaz and all the MBPSC skiing together in unison. At this point the mogul field was filled with skiers, over 50 skied together. Colours flashed between the white mounds, the calls of the Rainbow Gorillaz travelled into the valley. The music got louder. A deep bass throbbed in time with the skiers’ turns. The Gang-gangs left their trees and transformed into fur clad humans holding beers and bubbles. Their wings turned into hands and started clapping. Their beaks turned into mouths and started cheering. The energy filled the mountain, and everyone felt a deep loving warmth enter their stomachs, then their chests. They felt connected. The Rainbow Gorillaz stopped. The Green Blog calmly approached them. She smiled and held out her arms. She was vulnerable. She was scared. But it felt right. The Gorillaz opened their arms too. They hugged. The MBPSC gathered around the hugging Gorillaz and Blob. 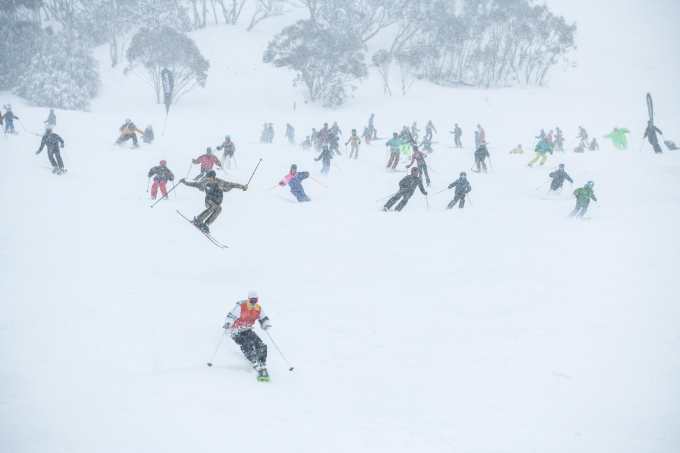 The skiers in tweed, the squads in fluoro and the back-flipping caffeinated group all joined in on the hug. Everyone, so different, so strange found comfort in knowing they had shared a magic moment. They named it FreeBOM.